"I always enjoyed making things," said Hiroyuki Hamada, who grew up in the suburbs of Tokyo and today has a studio in East Hampton. "But everything changed when realized I was an artist." Mr. Hamada's most recent exhibit, at Swarthmore College's List Gallery in Pennsylvania, closed just weeks ago. "Hiroyuki's art is definitely a journey toward a universal language," said Andrea Packard, the List Gallery's director. The show, a selection of wall pieces, freestanding sculptures, and works on artist-made pedestals, was enthusiastically received not only by the college but by the broader community as well. "I think that he's very good at creating works that speak differently to different people," Ms. Packard continued. "One person might see the work in terms of formalist or minimalist idioms, another would see elements of Japanese culture, Buddhism, or the language of technology. One of the most powerful things about his work is that it is multivalent in its associations." "I'm sort of working behind my brain to get wherever I'm headed," the artist said. 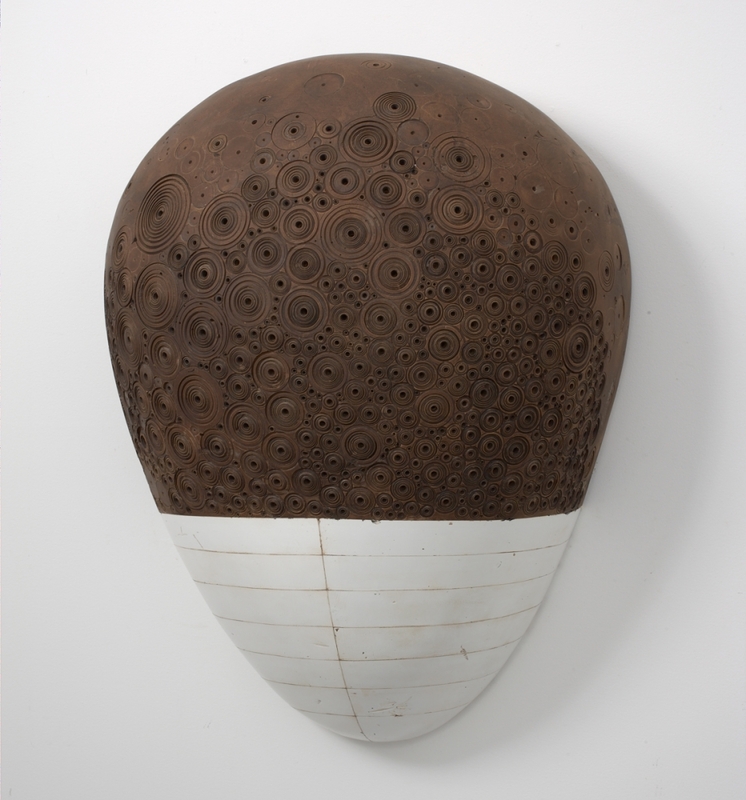 In fact, the black ovoid clinging to his studio wall ("#66") looks conspicuously like a human head. Then it looks like a giant moon rock polished to a soft shine as if handled for decades. Mr. Hamada's art is filled with things that look like other things. Then you blink, and suddenly they look just like themselves. Contemplative, illusory, and mutable, his imagery as well as his approach is plastic in nature. Beehives, throat lozenges, Life Savers, and torpedo silhouettes fill the studio, their surfaces variously pocked and dimpled, honed to a glossy sheen, or stacked into subcontinents that cleave to shared edges. Rubbing resins, wax, and pigment into smoothed and sanded layers of plaster, Mr. Hamada transforms basic construction materials into something swelling with spiritual consciousness. It feels as though a pulse might lurk beneath the finished surface of each object, instead of the structural foam, burlap, and plaster the artist claims are there. In spite of such contradictions, Mr. Hamada's work achieves a synthesis throughout that is resonant, even tribal, in its homogeneity. "I was a rebellious kid," he mused. "I guess I was mad about life's imperfections, I was angry." Mr. Hamada moved to the United States fresh out of high school. He didn't much care for the Japanese suburbs but, at odds with his parents, he was reluctant to move abroad when his father, who worked in the steel industry, relocated the family to West Virginia. "I was just hanging around, so my father said, 'Come with us.' I didn't really have anything else going on, so I did." The young rebel didn't speak English, so he enrolled in the local community college. Learning a new language was a revelation. "If everyone on earth had to learn one another's language, all our problems would be solved," he said. Mr. Hamada went through a conversion, a propitious one, you might say, during this period. "I had a teacher who was a painter," he said. "Before that, I never knew you could be an artist. The idea that you could put things together on paper and make something significant - something that it could move you - that changed everything for me. At a certain point, it just became so obvious that I was a visual artist." Three years later, when his family returned to Japan, he decided to stay Stateside. "It seemed like a good idea to live here," he said, then paused. "But... maybe they abandoned me." The young artist soldiered on. He went to graduate school and then embarked on a series of residences at venerated artists' colonies such as Skowhegan, the Edward Albee Foundation, and the MacDowell Colony. He met his wife, Evan Harris, a writer, at MacDowell. "I commuted between New Jersey and East Hampton until she finally asked me to move in," Mr. Hamada said. The couple now share the joys as well as the exhaustion of two young children. Back in his studio, concoctions of Damar varnish, turpentine, roofing tar, and melted was lined worktables. Curls of painter's tape cascaded over the sides like bright waterfalls. Other than blue tape and a single bucket filled with plastic Easter eggs, the studio was nearly devoid of color. "Kids," he said, looking down at a mound of broken eggshells while walking through racks of electrical drills, sanders, slabs of foam, and power cords. A work in progress, "#56," hung on the far wall of the studio. Incised lines filled with oily pigment define the frontal plane as Herringbone patterns weave across its surface. One of his signature marks, concentric circles gently drilled into plaster, dot the surface like tiny crop circles. In other works, pencil-thin lines glide birds in formation, swaying in mathematical warps as if guided by a giant elliptical compass. The preciseness is uncanny, and it lends a machine-age quality to the work, as if parts were discovered in an abandoned airplane hanger and buffed to a shine after years of neglect. Another work, "#61," is a meditation on linearity interrupted by a chocolate-brown horizon. Shaped into an eggy cranium, the upper half is covered with larvae-like buds that proliferate like cocoa beans run amok. Its bottom half, a testament to self-discipline, is segmented into geometric ribs that straddle a central spine. They flay outward like inverted frets, each segment incised into plaster and then saturated with resin. Sinking into the surface, Mr. Hamada's lines mark their surface much the way a tattoo impregnates human skin. They exude a sense of permanence and immutability. And there lies the proverbial rub. The humanness of this work is undeniable, not only because of certain anthropomorphic qualities but also because they exude a fragmented yet genuine pathos. They exist outside realism and abstraction - separate from divinity but at the same tie contemplative, even devotional. "I'm not nationalistic at all," Mr. Hamada said. "I have no strong allegiance to any country." Yet his works exude a zen-ness as if just rolled in a dust bath of pure Buddha-nature. Like all interesting artists, Mr. Hamada is one in a long chain of antecedents. Chief among his is Constantin Brancusi, the Romanian artist who shook things up early in the last century with "Endless Columns" and pedestal constructions. Mr. Hamada's roots are situated not only alongside the elder artist, but astride a long legacy that ranges from Cycladic idols to African sculpture, from Hindu architecture to Inuit homes. Distinctly minimalist, his works roll over and over, switching from the ritualistic to the urbane. What resembles a Buddhist pillow transforms into a Bayer aspirin. A facial facade mutates into a beetle, a seedpod, or a chrome dome. A prayer tablet shape-shifts into a bathtub. And so on. In their own way, Mr. Hamada's works, sotto voce as they are, are exquisitely playful, bubbling with life and animation. Working with an austere palette - one that is hard-wrought as opposed to selected - Mr. Hamada derives his pigmentation from nature: ivory, white, asphaltum black, earthy brown. Striking a balance between what is seen and what is remembered, the artist follows a path that marks its transitions in subtle turns, as if following in the path of an ever-widening spiral. "Some people do things because they like it," he said, "some because they're good at it. I'm lucky because maybe I have a little bit of both."